Effects: radiant, reviving and stimulating; antiviral, antibacterial, antiseptic, disinfects, refreshes, immunostimulatory, tonic, increases concentration; analgesic in rheumatism, arthritis and varicose veins; whitening; lowers blood pressure. 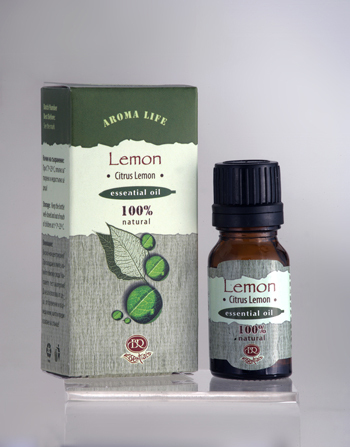 Benefits: Lemon essential oil helps the body to fight infection (in hepatitis, respiratory infections, colds, flu, bronchitis, sinusitis, fever, headache); it is useful in burners to prevent the spread of infection; it is recommended for removal of slags out of the organism, in cases of cellulites. Lemon oil helps with headaches, nausea, dizziness caused by fatigue. Reduces bleeding of skin and gums wounds, has anti-bacterial activity, bleaches the tooth enamel and prevents the development of tooth caries, freshens the mouth. In cosmetics, added to cosmetic creams or massage blends it helps oily and problematic skin, whitening pigmentation, improving face complexion, eliminating the network of varicose veins. Hand baths with lemon oil effectively strengthen and whiten nails. Blends well with other citrus and floral aromas, and most of the other essential oils. If a blend smells wrong or confused, adding a few drops of lemon often improves the flavor. Use: aromalamp, inhalation, gargle, air fresheners, bath, massage. Attention: Contraindicated for epileptics, hypotonic patients, in cases of chemotherapy, nursing mothers, pregnant women, children and people with individual intolerance to lemon. Do not apply directly to skin before sun exposure! When applied on mucous membranes to be diluted with base oils!